Deborah Clearman, author of Todos Santos, says of Meredith Sue Willis’s new novel that Willis “turns her considerable talents to explore a new part of the world: the downtrodden New Jersey waterfront undergoing a radical Gold Coast transformation. 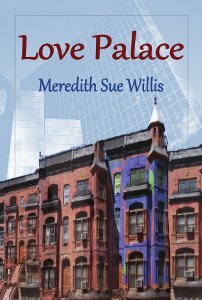 In Love Palace Willis has created a memorable cast of characters and a pitch perfect sense of place. The tale of a quixotic battle against redevelopment is narrated by an unlikely heroine. Martha Miller is neurotic, over-educated, under-achieving, over-libidoed, and in a tailspin over being left by Rotter number 3, her long-term boyfriend. (Rotter number 1 was her father; Rotter number 2, her ex-husband).